carbon.now.sh by @dawn_labs is a wonderful tool that lets you generate beautiful images of your source code through an intuitive UI, while letting you customize aspects like fonts, themes, window controls and much more. carbon-now-cli gives you the full power of Carbon — right at your fingertips, inside the terminal. Generate beautiful images from a source file, or sections of a source file, by running a single command. and you’d like to make a beautiful image out of it. You could approach this in several ways. 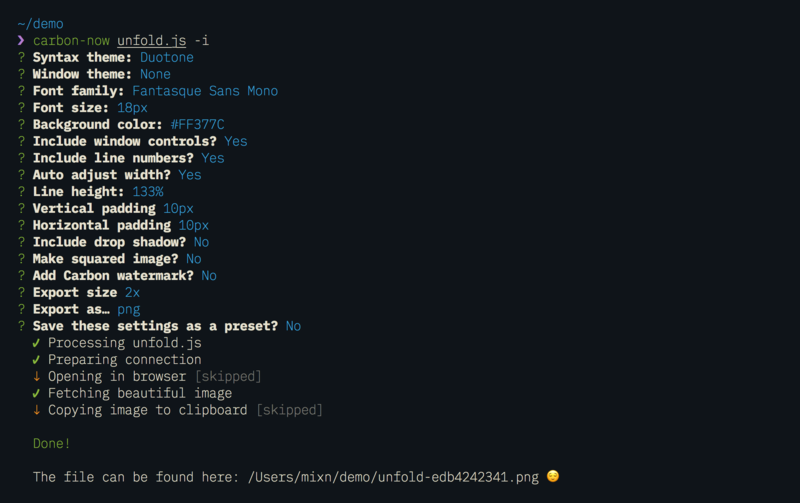 Takes the entire source of unfold.js, uses Carbon’s default settings and saves as .png into your cwd. Launches an interactive mode, prompting questions, allowing you to customize every aspect of Carbon, like syntax theme, font-family, padding, drop-shadow, etc. If you’re not sure what each question, e.g. “Make squared image?”, refers to, just confirm by hitting Enter — it will default to a sensible, nice-looking thing. If needed, you can always check the default settings. Reads and creates an image based on lines 3 to 6, instead of the entire file. Will throw an error if -s > -e.
It is sometimes desired to just put the image in the clipboard, so that it can be instantly pasted into other apps (like Keynote 💻 or Twitter 🐦 ). This is what the --copy/-c flag is for. will copy the image to clipboard instead of downloading it to a given directory. Please be aware that this requires some binaries to be present on certain OS. Also make sure the nircmd command is globally accessible/inside your Windows directory. You’ll sometimes find yourself in a situation where you’d like to create an image based on a piece of code, but don’t want to be creating a file for it first. In addition to files, carbon-now-cli therefore also accepts input coming from stdin or the clipboard. For demonstration purposes, here is an example using all options. This saves a beautiful image of lines 3 to 6 to ~/Desktop/example-23.png, after accepting custom wishes via interactive mode. If you’re not sure how exactly the image will turn out, you can always use -o or --open. The most requested feature after carbon-now-cli’s initial release has been the support for reusable settings, to not having to go through the entire process of answering all questions in interactive mode each time. However you use the carbon-now command, a ~/.carbon-now.json file will be created for you. This is where all your presets and the settings of the last interactive run will live. latest-preset will be overwritten after each interactive run. presentation is meant to stay until you eventually decide to delete it manually. If a given preset or ~/.carbon-now.json doesn’t exist, carbon-now-cli will fall back to the default settings. Any time you use -i, carbon-now-cli will automatically reuse those settings for its next run. It is possible to use local configuration files via the --config flag. This is convenient if you’re using carbon-now-cli via a script and would like to share presets among the users of your project.